The province of Albay is the last destination of our regional trip. 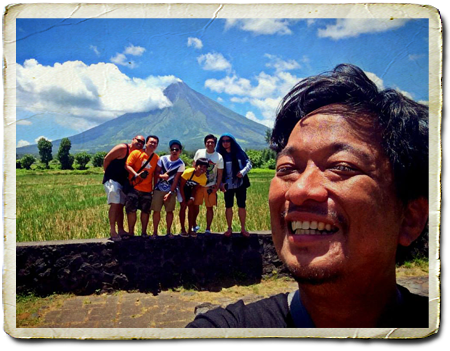 My friends and I went to Legazpi City to get a closer look at Mount Mayon and this is as close as we can get - about 5 kilometers from the base of the volcano. This is actually my first time to see this majestic mountain. That's Don of bonggaba.com doing a groupie shot for us. We are lucky to have seen the peak that day. Sometimes a big cloud can hide the upper half of the volcano for an entire day. On rainy days you wouldn't even see the entire mountain! Here's another photo of the "bulkan" by our friend Thryke. Mount Mayon's peak is 2,463 meters above sea level. You can actually see the peak from Camarines Sur, peeping above other mountains in the region. Mayon is an active volcano. In this same month last year it had a surprise phreatic eruption that lasted 73 seconds. That short moment, I'm sad to mention, caused the death of 5 climbers - 3 Germans, 1 Spaniard and a Filipino guide. The volcano had over 48 eruptions in the past 400 years. One of which bombarded the town of Cagsawa in 1814. The bell tower in this photo is all that was left of their church that was built in 1724. Yeah it may have done a lot of ugly stuff but no one could ever deny its beauty. 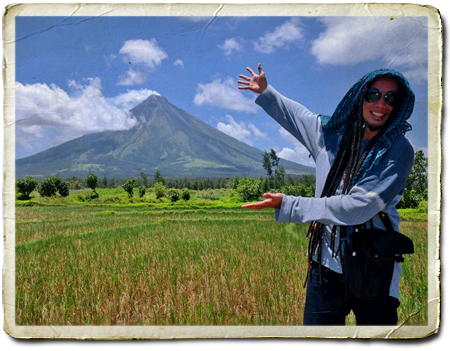 Because of it's near symmetry, Mayon is renowned as the "perfect cone". 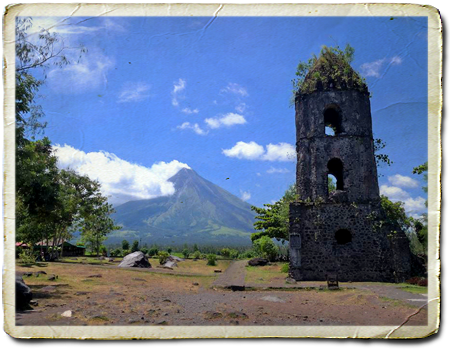 The name itself is from the Bicolano word "magayon" which means "beautiful".